Everywhere I search, the same recipe and variations pop up. 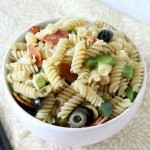 Pasta salad is different to my family than it is to other families. Other people share their recipes with me, but it’s never the same. But I’m sure you’ll fall in in love with this recipe. It has served my family well for over four years. 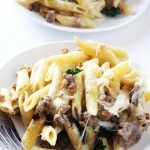 Made with inexpensive ingredients, this recipe is sure to be a hit. 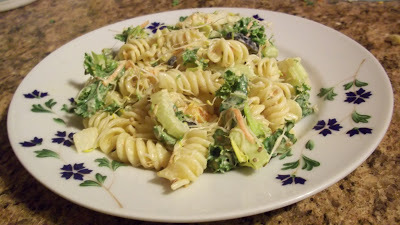 I’ve also tried this recipe using different combinations of vegetables such as substituting spinach for the kale, green olives for the ripe olives, and shallots for the onion. 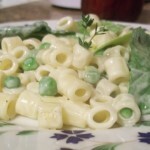 This recipe is easily adaptable around what kinds of vegetables or pasta you’ve got lying around. Maybe you only have penne noodles or shells. No biggie. Just adjust the cook time of the pasta to the boxes directions. 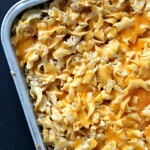 Also fell free to double this recipe or even triple it and pack in your kids lunches during the week. Adjust the flavoring to your families tastes so that it’s a dish that everyone will want to see in their lunch box week after week. 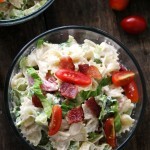 An easily adaptable recipe for spectacular pasta salad. Cook noodles as recommended on box. Drain and run under cold water until completely cooled. In a large bowl, combine all of the vegetables. Stir. To the vegetables, add the mayonnaise and italian seasoning. Mix until the mayonnaise is evenly distributed. Add the noodles. Stir.